Contributed by Justin Veda, Megan Oswald, Ryan Robinson, and Anthony Pankuch. At the crossroads of confident and creative lies Bernard Saper. A man so bold he sent his writing to the likes of Oprah Winfrey and attempted to cast such A-list actors as Robin Williams in his potential movies. He would do all of this in the pursuit of understanding the effects of humor on the human mind. There are few others like him; he is truly one of a kind in the world of psychology. 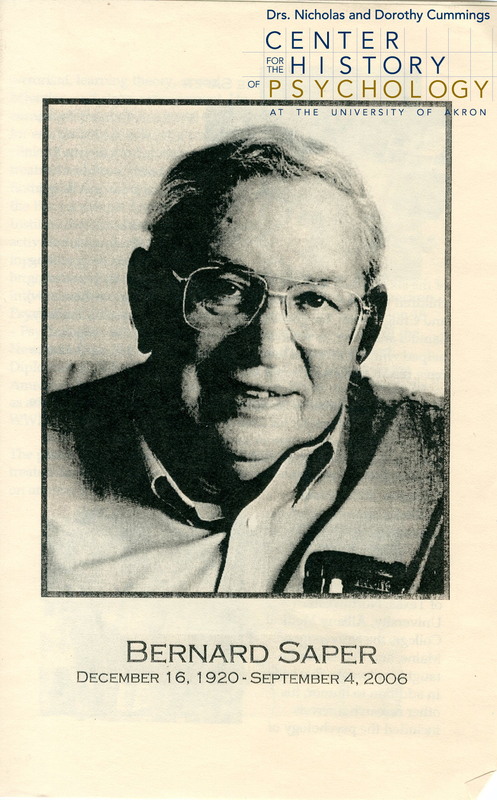 The Bernard Saper papers are now available to researchers. Bernard Saper was born December 16, 1920 in Brooklyn, New York. He earned his bachelor’s degree in psychology from Brooklyn College in 1946. He received his master’s degree from Columbia University and a doctoral degree in clinical psychology from the University of California in 1952. 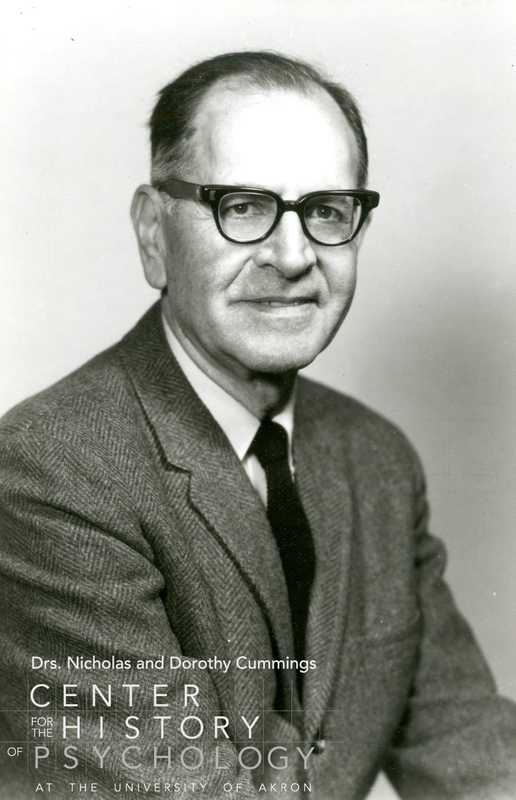 Saper became director of psychological services at the New York State Department of Mental Hygiene in 1958, and in 1965 he was appointed director of the Bureau of Functional Programming, where he advised architects on the design of facilities. In 1967, he began work as a faculty member of the Albany Medical College, and two years later became professor of psychology and director of the Institute for Psychological Applications at the University of Maine. He would go on to become professor of psychology at Florida International University. He was a founding member of the South Florida School of Professional Psychology. There are many wonders and hidden gems to be discovered in the 11 boxes that contain the Bernard Saper papers. 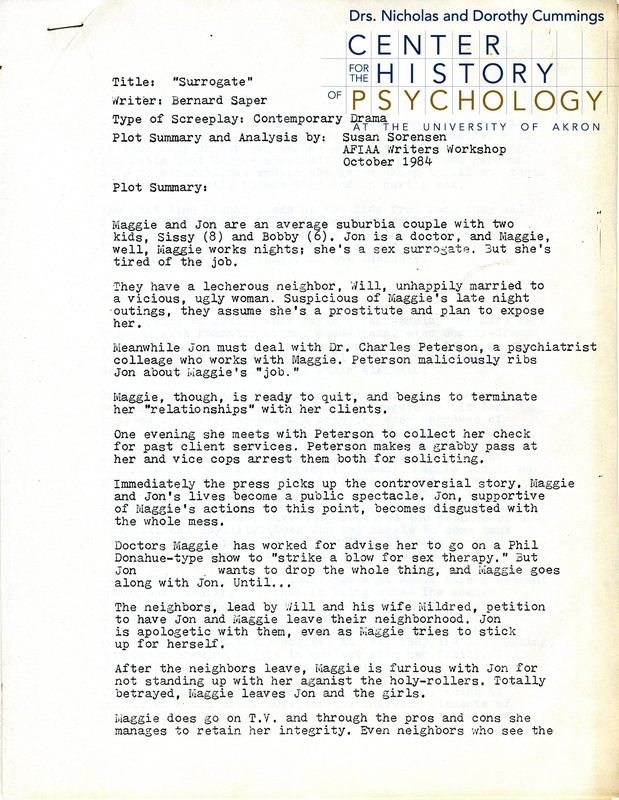 See notes and research compiled by Bernard Saper in his research surrounding the psychology of humor in the Research Files series. 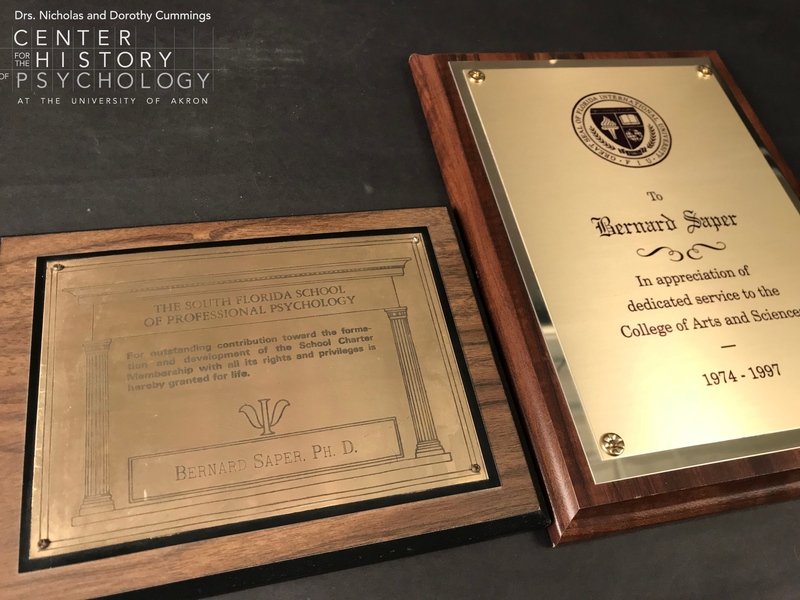 Look through the Academic Files series to see the very notes he used in teaching his lectures to the next generation of psychologists in his various teaching roles. And, read through original rough drafts of his book Conditional Triumph along with never-before-seen books and teleplays waiting to be read within the Written Works series. Please note some files are restricted. The processing of this archival collection fulfilled requirements for students enrolled in the course Foundations of Museums and Archives I and was generously sponsored by the EX[L] Center at The University of Akron. Contributed by Jillian Phipps, Pennie Fordham, and Katherine Gray. Have you ever wondered where the idea that positive actions should be rewarded came from? Have you ever wondered where the concept of bad behavior being its own punishment came from? If so, then check out the Sidney Bijou papers, which are now available for research at the CCHP. Sidney Bijou (1908-2009) was a psychologist who specialized in child psychology, behaviorism, and studies on autism. Many of Bijou’s studies showed that encouraging good behavior led to more good behavior, more so than when bad behavior was punished. Bijou traveled all over the world to give symposiums on his research. Some of Bijou’s major works include Behavior Analysis of Child Development (1993) and Childhood Development: The Basic Stage of Early Childhood (1976). He contributed to other works, such as New Directions in Behavior Development and Behavior Modification: Contributions to Education, both with Emilio Ribes-Inesta. 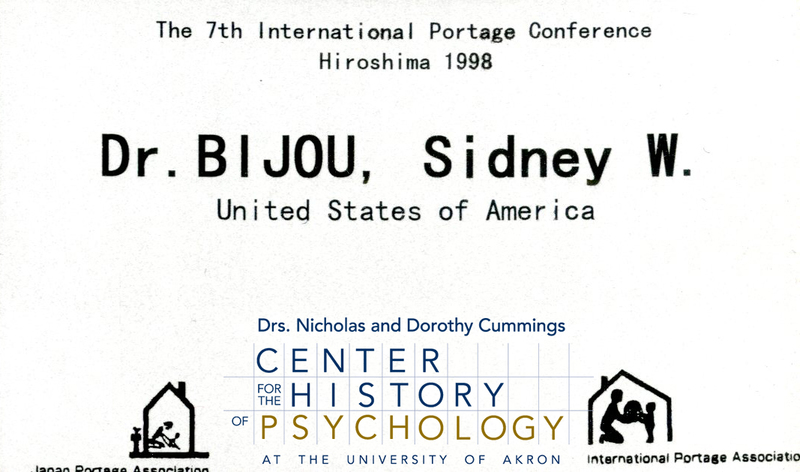 The Sidney Bijou papers include his academic works, from when he was in college as a student to when he was teaching as a professor; his research files for his written works; manuscripts of the written works themselves; reference files that show what he was working on year to year; and biographical information on his career that he compiled himself. His papers contain 13 boxes of archival materials. 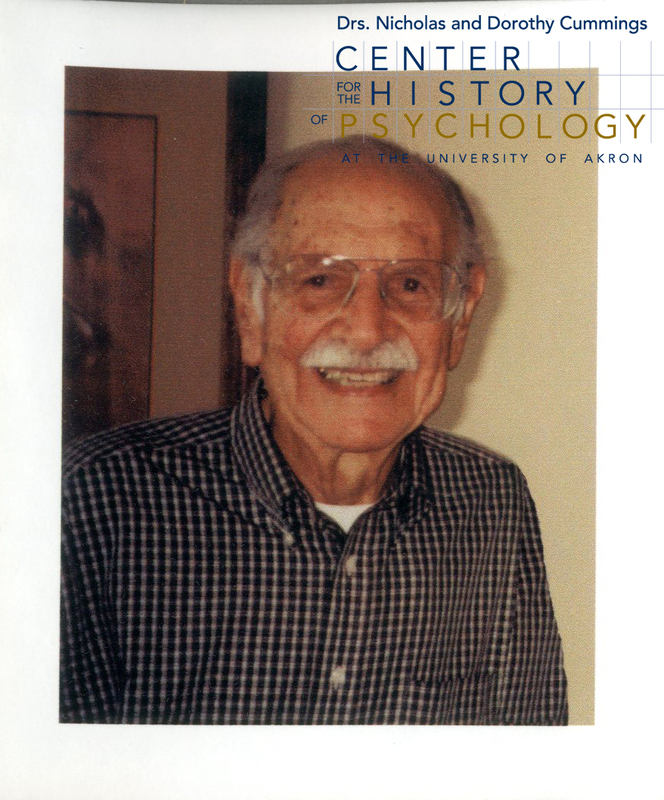 These files contain most of his work in child psychology, behaviorism, and autism research. Of special note in Bijou’s files is his work on effective teaching and treatment methods for autistic children (1990-1998). In these files, Bijou has different curricula, class designs, and possible ways to assist autistic children in integrating into the public school system. 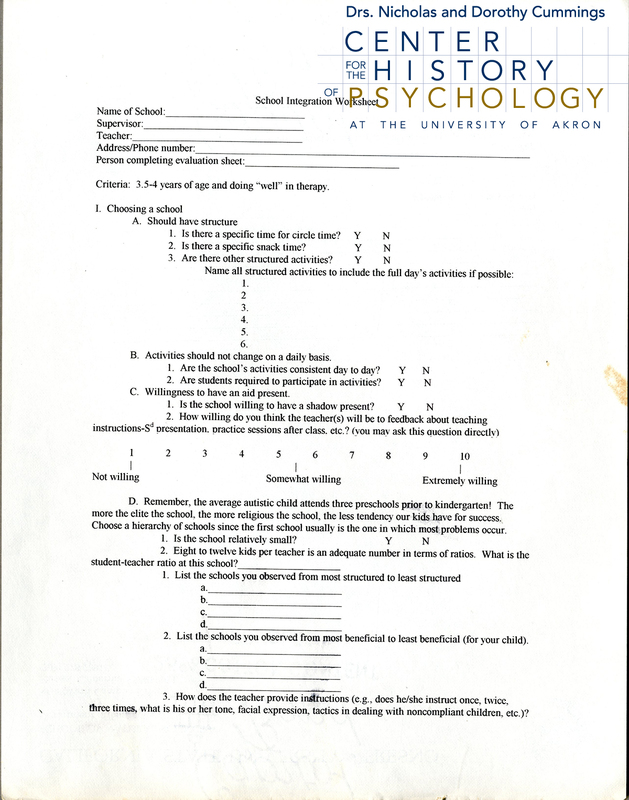 Example of the worksheets Bijou used to assess how well schools were integrating autistic children. From box M6293, Folder 7.